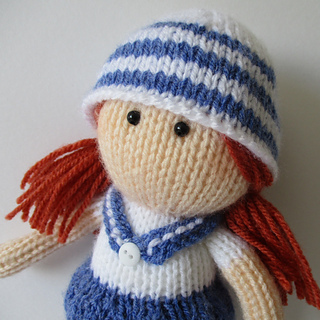 Sally is approximately 26cm tall. 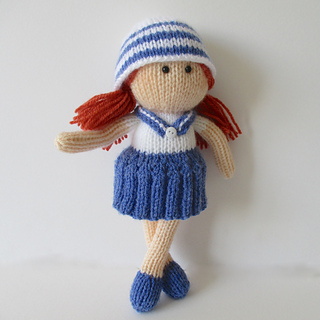 Sally Sailor is wearing the nautical look with her pleated blue skirt, sailor top and hat. 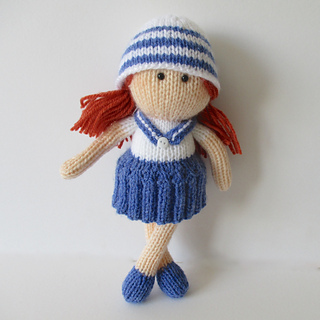 You can knit your own sailor doll with this pattern. 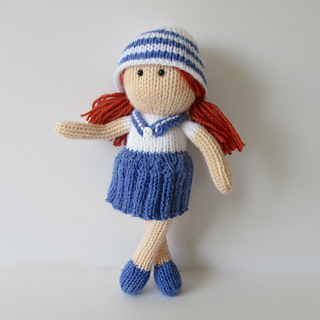 THE PATTERN INCLUDES: Row numbers for each step so you don’t lose your place, instructions for making Sally plus 16 photos, a list of abbreviations and explanation of some techniques, a materials list and recommended yarns. The pattern is 6 pages and written in English. TECHNIQUES: All pieces are knitted flat (back and forth) on a pair of straight knitting needles. You will need to cast on and off, knit, purl, work increases and decreases, sew seams and knit stripes (i.e. changing colour at the end of a row). This pattern incorporates a three needle join for the skirt, and step by step instructions with photos are included in the pattern.